In this "raucous, moving, and necessary" (San Francisco Chronicle) story by a Pulitzer Prize finalist, the De La Cruzes, a family on the Mexican-American border, celebrate two of their most beloved relatives during a joyous and bittersweet weekend. "All we do, mija, is love. Love is the answer. Nothing stops it. Not borders. Not death." In his final days, beloved and ailing patriarch Miguel Angel de La Cruz, affectionately called Big Angel, has summoned his entire clan for one last legendary birthday party. But as the party approaches, his mother, nearly one hundred, dies, transforming the weekend into a farewell doubleheader. Among the guests is Big Angel's half brother, known as Little Angel, who must reckon with the truth that although he shares a father with his siblings, he has not, as a half gringo, shared a life. Across two bittersweet days in their San Diego neighborhood, the revelers mingle among the palm trees and cacti, celebrating the lives of Big Angel and his mother, and recounting the many inspiring tales that have passed into family lore, the acts both ordinary and heroic that brought these citizens to a fraught and sublime country and allowed them to flourish in the land they have come to call home. 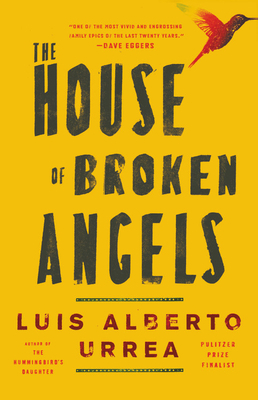 Teeming with brilliance and humor, authentic at every turn, The House of Broken Angels is Luis Alberto Urrea at his best, and cements his reputation as a storyteller of the first rank. A finalist for the Pulitzer Prize for his landmark work of nonficiton The Devil's Highway, Luis Alberto Urrea is also the bestselling author of the novels The Hummingbird's Daughter, Into the Beautiful North, and Queen of America, as well as the story collection The Water Museum, a PEN/Faulkner Award finalist. He has won the Lannan Literary Award, an Edgar Award, and a 2017 American Academy of Arts and Letters Award in Literature, among many other honors. Born in Tijuana to a Mexican father and American mother, he lives outside of Chicago and teaches at the University of Illinois-Chicago. "The kind of sweeping family saga you lose yourself in--big and warm, and rich with history and love and culture." "Two paragraph is and I was unabashedly in love with Luis Alberto Urrea's masterful and richly textured new novel, The House of Broken Angel, about this family that manages to be both extraordinary and completely ordinary...Few characters are as alive as Big Angel, and few stories have resonated with me as much as this one." "This, the most personal book by the great American novelist Luis Alberto Urrea, is one of the most vivid and engrossing family epics of the last twenty years." agendas and secrets, but at the same time, all share a commitment to family. 'All we do, mija,' Big Angel tells his daughter, 'is love. Love is the answer.